This is the first of the graphic novel adaptations of the children’s book character, Thea Stilton. She is a spin-off of Geronimo Stilton all created by Elisabetta Dami starting in 2000 in Italy. Geronimo Stilton even made the leap to television and has been translated into many languages, including English as in this instance. The series is very popular but this was my first exposure to it. Thea is the younger sister of Geronimo and the conceit of the series is that the named hero (be it Geronimo or Thea) is the author of the adventures. So we have this book authored by “Thea Stilton” but ably assisted by a veritable army of contributors consisting of editorial coordination, artistic coordination, editing, script supervision, story, design, color and art. It take a village. This is a full color world of anthropomorphic mice set in a world with a structure and level of technology that matches our own. 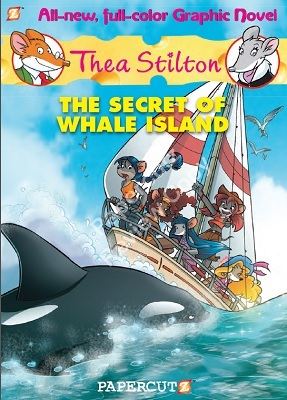 In this tale, we follow the Thea sisters, 5 students at Mouseford Academy on Whale Island (just north of Mouse Island) that are training to be journalists, but find plenty of adventure in the interim. We start just before term begins and Thea promising to try to get back to Whale Island in time for the big dance that kicks off the school year. The term starts when the whale migration goes past the island but a lonesome orca is causing potential trouble. We learn that Dina, a new student, will be the first whale island resident to study at the Academy. We don’t get a formal introduction to the Thea sisters but their names are sprinkled amongst the dialogue. I think this was a missed opportunity because I was unsure of the characters’ names at first, even though the characters are distinct individuals. Based on the cover and an interior graphic, I am assuming the five characters pictured are the Thea sisters. The hair styles and color helped to separate them visually instantly and there is sufficient character development for each but I can’t guarantee I got the names correct at first. Collette is the blond with the big hair and popular with the boys (she has three offers to go to the dance), Pamela (Pam) is the tall, curly haired brunette who has driving skill but is a little miffed she has no offers for the dance. Violet is the straight, black haired one who is good with devices. It takes to page 24 to get Paulina’s name, the one with the long, braided dark hair, who appears to be the sensible one. Nicky, the spunky, cowboy hat wearing one was not named until much later (page 38). The names are not needed but if you want to know their names, it took a little digging. There were a few instances where the word balloon order made the names a bit more confusing. An adventure hook is set up, the Thea sisters investigate, and in the end the big dance happens (various romantic subplots work their way out along the way). This provides a complete adventure. There is some vague threat but no specific violence except minor injuries to Leopold from an accident at sea (which occurs off panel). There is some gentle pro-environmental messages and three footnotes denoting facts about different sea life but free from being overly preachy. I would remiss if I didn’t mention the excellent art in this book. Art is credited to Cristina Girogilli and Raffaella Seccia with colors by Giulia Basile and Ketty Formaggio. It is a very clean look reminiscent of the best of the Disney comics. The book has sufficient detail but is not cluttered. There was no visual confusion of characters even though Dina and Violet have similar hair color and style. I lack the hairstyle vocabulary to correctly identify but Dina has a sort of bob to her hair. I forgot how much I enjoyed thought balloons back in comics. I would have no problem recommending this for any young reader (probably 6 to 12). I would not really characterize this as all ages though because I feel there is not enough in this to really warrant many adult readers. While the art is great to look at, the story does not provide much deeper insight in the human (or is that mouse?) condition. I do like that there is a life to the characters outside the mystery presented (unlike a Scooby Doo cartoon) but not quite enough for a more mature taste. That being said, I did enjoy it and if any reader of any age wants some light reading, tuck in as at a minimum the art is quite pleasing. This entry was posted in All Ages Comics, Papercutz and tagged All Ages, comics, Papercutz, Thea Stilton. Bookmark the permalink.